Fort Hall (1834-1856) (1859-1860) - In 1834 Nathaniel Jarvis Wyeth established a log stockaded trade post with two bastions located at the confluence of the Owyhee and Portneuf Rivers where they flow into the Snake River in Bannock County, Idaho. Named after Henry Hall whose company sponsored Wyeth's expedition. The Hudson's Bay Company (HBC) acquired the fort in 1837 and abandoned it about 1856. Fort Hall Replica Interior Buildings. Captain Nathaniel Jarvis Wyeth had become interested in trading in the Pacific Northwest and in 1833 he visited the annual get-together of trappers, traders, and Indians known as the Rendezvous. He made an agreement with representatives of the Rocky Mountain Fur Company to bring $3,000 worth of trade goods for them at the 1834 Rendezvous scheduled for Ham's Fork. The Rocky Mountain Fur Company refused to accept the goods. Wyeth moved on westward with the men and the goods until he reached the Snake River on 15 Jul 1834. On the 18th of July, he started the construction of a trading post named Fort Hall in honor of Henry Hall, a member of the company financing his enterprise. On 4 Aug 1834, he finished the log structure. The next morning he raised the United States flag and Fort Hall came into existence. Soon a Hudson's Bay Company (HBC) party was building a trading post, called Fort Boise (2), near the junction of Boise River with the Snake River. 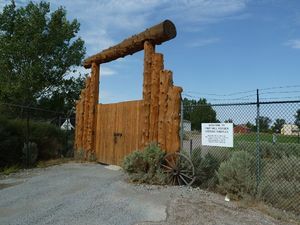 Fort Boise (2)'s purpose was to drive Fort Hall out of business. HBC overbid Wyeth in the payment for furs and underbid him in the sale of goods to the Indians and he was never able to make a decent profit from the Fort Hall business. In August 1837 Wyeth sold out to the HBC at a reported loss of about $30,000. The HBC banner replaced the America Flag at Fort Hall and remained there until the United States gained possession by the 1846 treaty with Britain. Thousands of settlers passed through Fort Hall as an important stop on the Oregon Trail but the fur trade declined and by 1856 HBC had closed both Fort Hall and Fort Boise (2). The fort fell into disrepair and was dismantled to build other facilities and the location of the site became lost to everyone but a small group of survivors of the early days. In 1916, one of these survivors, Joe Rainey, led searchers directly to the site "without hesitation". Artifacts confirmed the rediscovery. 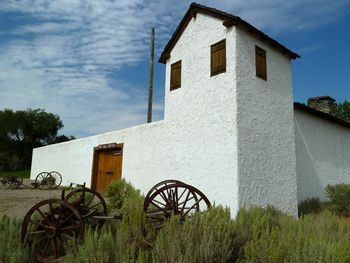 In 1963 a replica of the Fort was built in Pocatello. 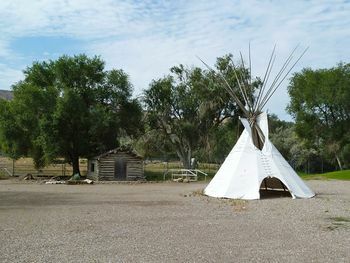 The replica is located in a fenced in area next to the Bannock County Historical Museum building at the end of the Avenue of the Chiefs South. The replica can be viewed year round but the inside is closed to the public from labor day to memorial day. and Portneuf Rivers where they flow into the Snake river in Bannock County, Idaho. USGS Geographic Names Information System (GNIS) Database Entry: 372756 Historic Site. This page was last modified 09:04, 20 April 2019 by Bill Thayer. Based on work by John Stanton.